Vampires, Robots, Sorcery... And that's all before gym class! 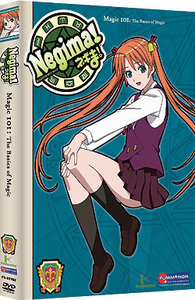 Wizard-in-training Negi Springfield is only 10 years old, but he also happens to be the newest English teacher at the all-girl Mahora Academy. Too bad a bachelor's degree and an enchanted staff can't prepare a lad for the chaos of being surrounded by dozens of Junior High girls! DVD Features: Image Gallery, Character Profiles, Trailers.